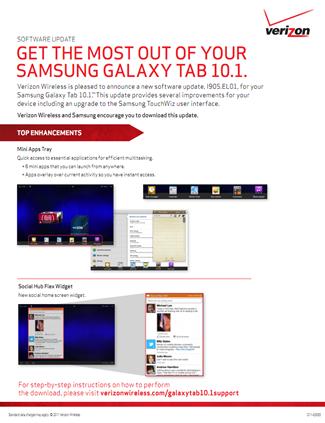 According to Verizon's system update documentation, owners of big red's Samsung Galaxy Tab 10.1 can expect a software update any time now. While it isn't the Ice Cream Sandwich users are undoubtedly craving, the update (bringing system software to I905-EL01) offers quite a few interesting features. Among these are improvements to Samsung's Touchwiz UX, a new Social Hub widget, built-in photo editing capabilities, and The Daily – a news app that allows users to "access the best of print, web, and broadcast news from around the world." 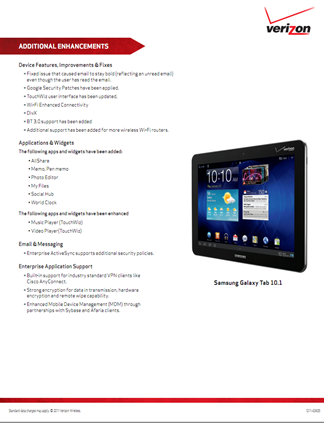 The update also brings Bluetooth 3.0 compatibility, additional support for more Wi-Fi routers, DivX, security patches, enhancements to TouchWiz's music and video players, and built-in support for "industry standard VPN clients." There's no word yet on just when the update will be available, but we'll be here to keep you updated.